Clearly Europe is an on going experiment, and it’s unity and disunity is a constantly shifting thing. This may be one of those times where it is going to go from being unified to being disunified. As always, time will tell. WTH is Brotip #1550, you ask? Now I think you will either love brotips or hate them. Bro’ language aside, the advice that I’ve come across is good. 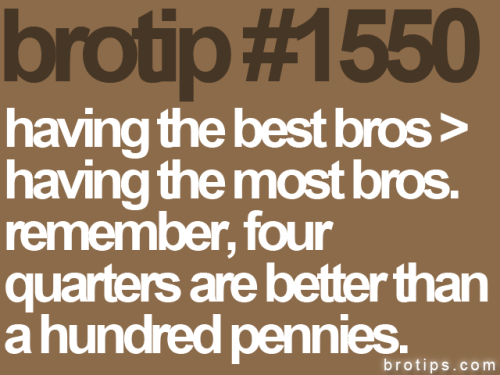 Click the link: brotips™ for more of them. Lots more! The National Post has a truly great graphic on the Mount Everest death toll (a chronicle of all of the lives claimed by the world’s tallest point). It is worth seeing to get a something of a sense of how deadly it is. One thing that jumped out at me, though, was this pair of statistics: the number of summit ascents between 1953 and 1981 was only 117, while the number of ascents between 1982 and 2006 was 3058. That’s an incredible increase. I think it says something about the times we live in that so many people want to climb Everest. Is New York going to replace Silicon Valley? Not yet. But according to this, For Tech Start-Ups, New York Has Increasing Allure – NYTimes.com, there are more and more startups taking off in NYC. While I can’t see the Valley fading away, I could see it having to compete for talent with NY. Whatever is said, where the work goes depends on where the talent is going to school and where the money is. I can’t see places like San Mateo or Palo Alto or Cupertino losing that for some time. However NYC has money and talent too. New York, and Brooklyn in particular, is hot again. The article doesn’t mention that, which is suprising, but if I were young I think Brooklyn could be the place to relocate to. So yeah, not going to replace, but definitely going to compete. Where can you find Sigur Ros and Aloe Blacc and Arcade Fire and ….well….pretty much anyone interesting? You might say: Black Cab Sessions…and that would be a good answer. But another place you can find alot of great independent music is at the Take Away Shows (Concert à emporter) at La Blogothèque. I like Blacc’s, it’s rich a cappella. But check out the site to find lots and lots of great artists performing. I came across this interview with the Carolina Chocolate Drops (Instrument Interview: Bones & Banjo via the Sleepover Shows) last night and I thought that it was a great lecture/discussion on the history of one segment of early American musical history. It’s only a 10 minute talk followed by a 2 minute song, but it is worth your time. And, perhaps more significant, it allowed Obama to avoid the GOP hashtag hijacking that has become par for the course whenever Obama has previously announced a social-media campaign ahead of time. Though Republicans did latch on to the hashtag eventually, the White House’s craftiness prevented the hashtag hijack from becoming too much of a social media centerpiece, as has happened with such efforts before.